Glen Frey had it right. "The Heat is On". Temperatures have been hovering in the 90°'s and 100° for the last five to six days across the country. 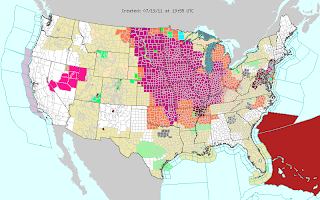 Heat warnings, advisories and or watches are in effect for 26 counties in the United States. Right now, it appears that the heat won't be going away anytime soon. The upper-level high pressure, I mentioned a couple days ago, is slowly progressing eastward across the middle section of the country. Did I mention it was moving slow?? It is going to take several days for it to move east of the Midwest. In the mean time, temperatures will continue to flirt with the 100° mark. Along with the heat, moisture is abundant in the lower levels of the atmosphere. Unfortunately, the moisture isn't in the way of rain. It is mainly in the form of thick, humid air. Currently, there is a broad area of dew points in the middle to upper 70° that stretches from North Daktoa to southwest Ohio. Amazingly, the Minneapolis airport has a recorded dew point of 82°. This makes it the most humid day for Minneapolis since 1891. The heat index at 2pm CT is 110°+ from eastern Iowa through north central Illinois and in north central South Dakota. High temperatures will continue to climb a couple of degrees each day through the weekend. The one bit of good news is the air won't get much humid than it is now. To get a look at my latest forecast for Cape Girardeau, Indianapolis, Indiana and St. Louis check out "John's Forecast". The heat can be extremely dangerous. Many don't realize this but heat is the leading weather cause of death in the United States. Often times it isn't the first couple of days in a heat wave that deaths occur, it is usually after several days when the temperatures don't drop much at night. It is a cumulative effect. Unfortunately deaths have already occurred from the heat in the St. Louis area and when dealing with this type of heat, that number is likely to go up. Stay safe. Check on your neighbors. Check on the elderly. Stay cool!